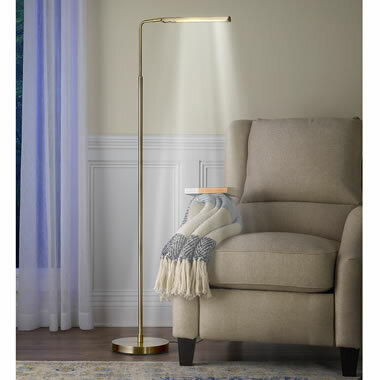 This is the gallery-style floor lamp with a head that rotates 350° to provide focused lighting for reading or hobbies. The light bar itself can swivel left or right to cast light wherever desired. Providing the same brightness as an incandescent bulb at a fraction of the energy consumption, the LED bulb features an anti-flicker and glare system to protect the eyes and reduce fatigue. A 3-way touch control dimmer easily adjusts the light intensity, automatically storing the last setting for next use. The slim profile and minimal base allows the lamp to be tucked discretely into corners or behind furniture. Antique Brass. 56 1/2" H x 22 1/2" W x 10" D.
The Easy Swivel Gallery Floor Lamp comes with The Hammacher Schlemmer Lifetime Guarantee. Items that we sell are guaranteed for their normal life under standard non-commercial use.